Mimicry refers to shared warning coloration between co-occurring species. There are two main classes of mimicry: Batesian, and Müllerian. Batesian mimicry is when a non-toxic species resembles a toxic species. 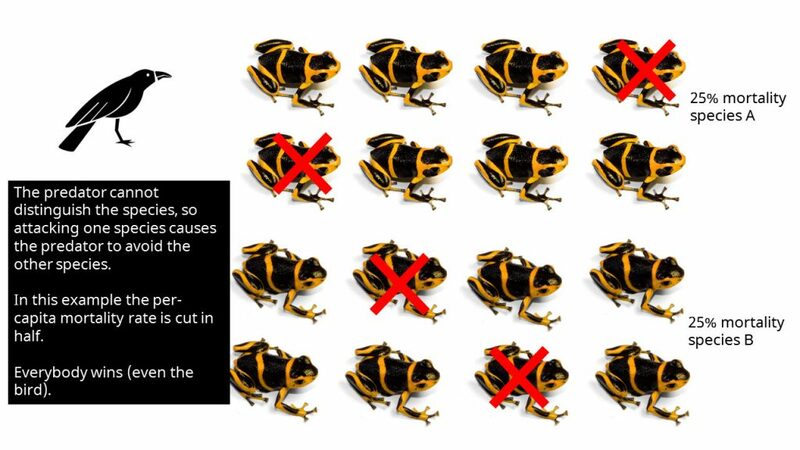 The benefits of Batesian mimicry are fairly obvious: by resembling a toxic species, a non-toxic species “tricks” a predator into thinking it is toxic, and thus avoids being attacked. Müllerian mimicry is when two (or more) toxic species share a common warning coloration. This spreads the cost of predator learning across a larger pool of individuals, reducing the per-capita mortality rate. In Müllerian mimicry, because both species are toxic and appear similar, a predator attacking species A will then avoid species B, and vise-versa. It is therefore a mutualistic relationship. An important point about Müllerian mimicry (and aposematic signals in general) is that they are positive-frequency dependent. This means they have “strength in numbers”: the more abundant a warning signal is, the greater protection it confers to those who possess it. This explains the elaborate mimicry rings in tropical butterflies, with numerous species “participating” by converging on a single wing pattern. 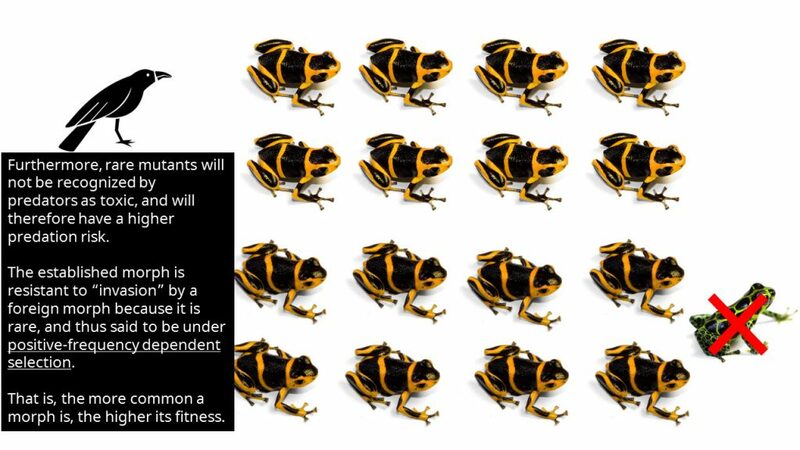 This positive-frequency dependence also means that novel phenotypes that do not conform to the local mimicry ring will be at a disadvantage. Because these individuals are not recognized by predators as being toxic, they will be selectively attacked. 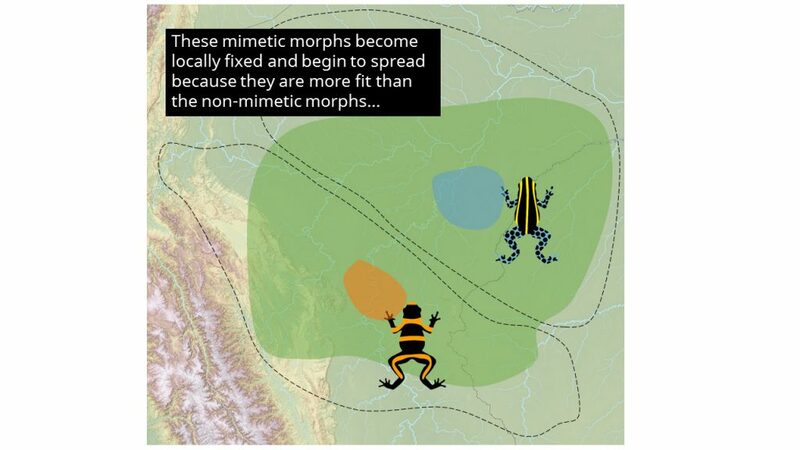 This means that once a mimetic morph is established in an area, it will be stable and resistant to invasion by a foreign morph. In north-central Peru, the dendrobatid species Ranitomeya imitator bears a striking resemblance to other species of Ranitomeya (Figure 1). 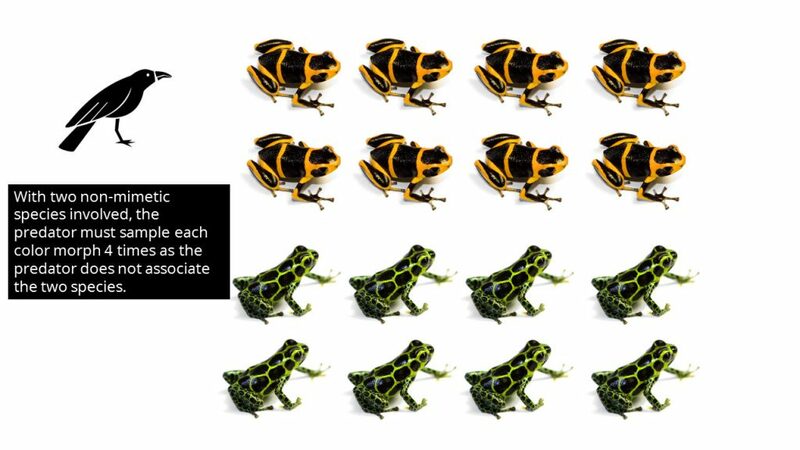 These morphs occur in different geographical areas, forming a “mosaic” of mimetic morphs across the landscape (Figure 2). The possibility of Müllerian mimicry in R. imitator was recognized by Rainer Schulte in the original description of the species (Schulte 1986). However, it was not rigorously tested till much later. A key aspect of mimicry is that warning coloration is shared not by common ancestry, but by convergent evolution. In other words, if two species appear similar because they are very closely related, this is not mimicry but simply a symplesiomorphy (shared ancestral character). Symula et al. (2001) provided phylogenetic evidence that that color similarity between R. imitator and its co-mimics was not due to common ancestry, thus supporting the hypothesis of Müllerian mimicry. They found that all populations of R. imitator—despite their highly variable coloration—were members of a single, variable species, and that the co-mimic species were more distantly related. This meant that the color morphs found in R. imitator evolved after the split from its co-mimics, supporting the mimicry hypothesis. Another important aspect of Müllerian mimicry is that co-mimics are (a) both toxic and (b) confer mutual protection on one another. In other words, a predator attacking species A will learn to avoid species B, and vise-versa. Surprisingly, these predictions were not tested in R. imitator until over a decade later, when Adam Stuckert published two papers on this topic. Alkaloid data confirmed that R. imitator was indeed toxic, possessing quantities of alkaloids comparable to (if not exceeding) that of the co-mimic species (Stuckert et al. 2014a). A predator-learning experiment further found that predators attacking the spotted morph of R. imitator learned to avoid attacking its co-mimic, the spotted morph of R. variabilis, and vise-versa (Stuckert et al. 2014b). While the evolution of mimicry causes phenotypic convergence among unrelated species, it can also drive phenotypic divergence within a species. If a species co-occurs with different potential model species, different mimetic morphs can be established in different geographical areas. Because these morphs are under local positive frequency-dependent selection, they are resistant to invasion by foreign morphs. 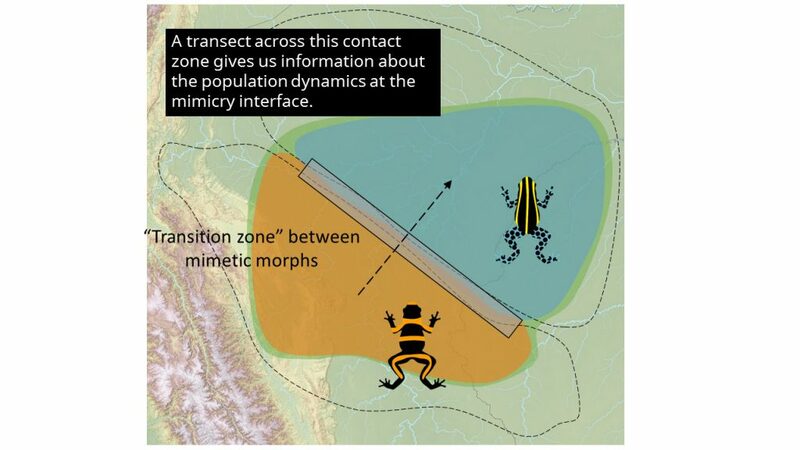 This can lead to the formation of narrow transition zones between different mimetic morphs. 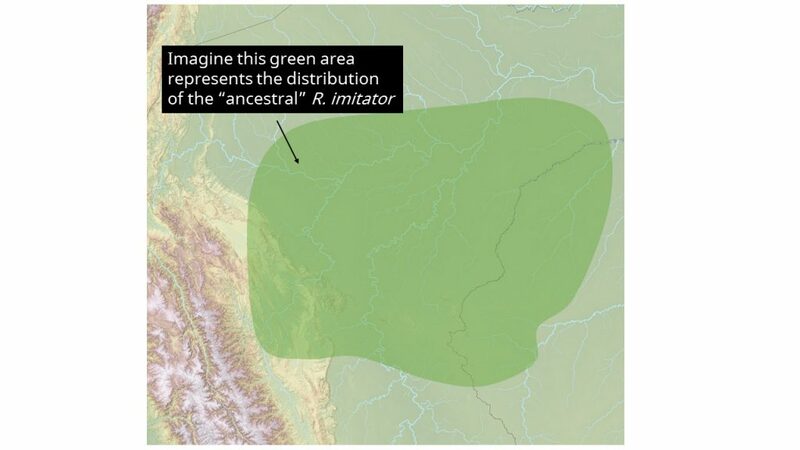 In R. imitator, three such zones have been identified (Twomey et al. 2014, 2016). Slideshow 2 – The establishment and spread of mimetic morphs and the formation of transition zones. Mimetic transition zones are of considerable interest for evolutionary biologists as they yield insights as to how populations of a single species diverge and become reproductively isolated, which may give clues about how new species are formed. For example, transition zones that are very narrow indicate that there is strong selection against immigrant phenotypes crossing the zone (crossing either physically by dispersal, or “crossing” indirectly via morph hybridization). 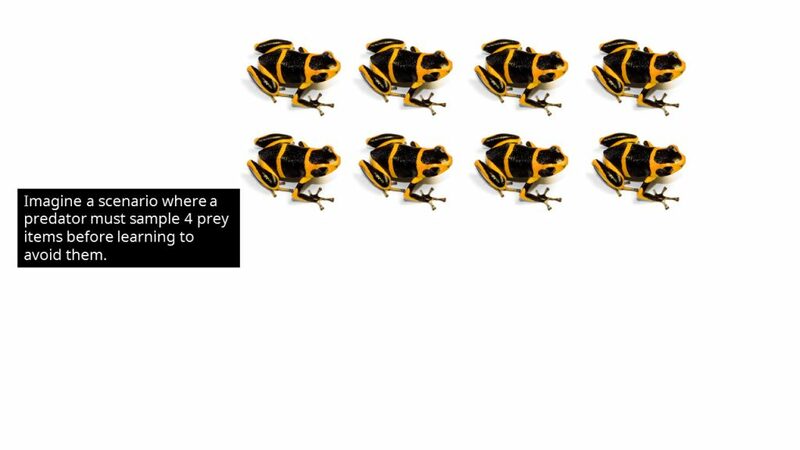 Morph-based assortative mating may also reinforce morph boundaries, leading to narrow transition zones. Ultimately, strong selection and assortative mating may reduce gene flow between morphs, leading to genetic structuring that coincides with the mimetic transition zone. 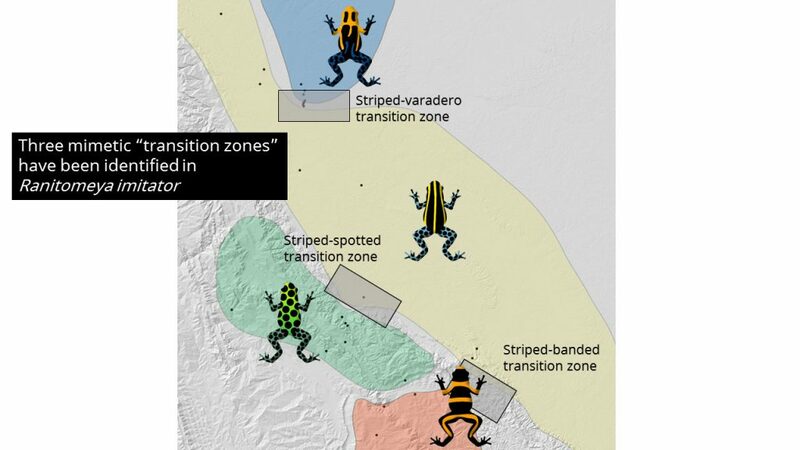 Slideshow 3 – Mimicry “transition zones” in Ranitomeya imitator. In R. imitator, field work has led to the discovery of three mimetic transition zones: striped-banded, striped-spotted, and striped-varadero. These transition zones are characterized by narrow areas of rapid phenotypic change. 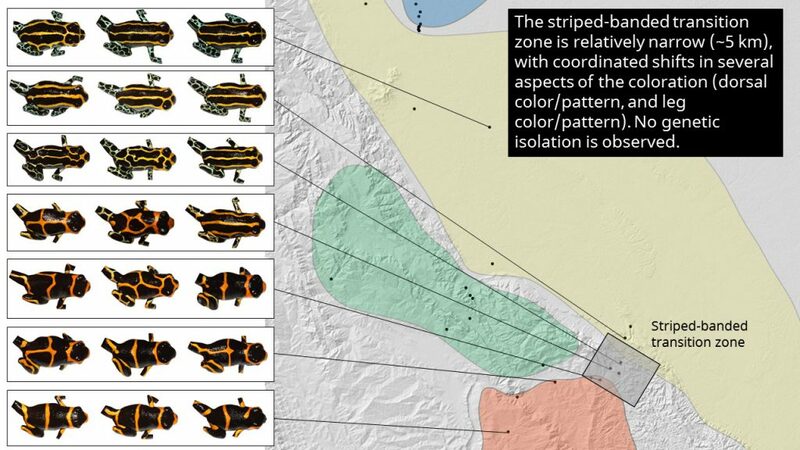 For example, in the striped-banded transition zone, the Huallaga Canyon provides a “natural” transect: in the upper and lower areas of the canyon, pure banded and striped morphs are found, respectively. 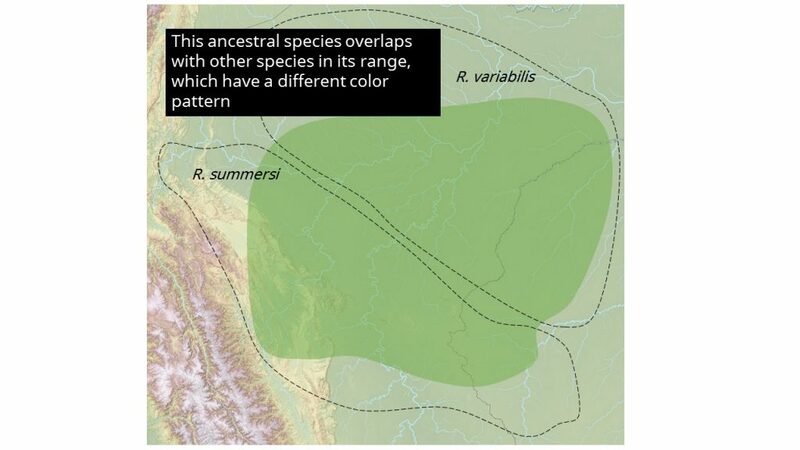 In the central areas, there is a shift from banded to striped phenotypes that occurs over a relatively short stretch of river (~5 km). 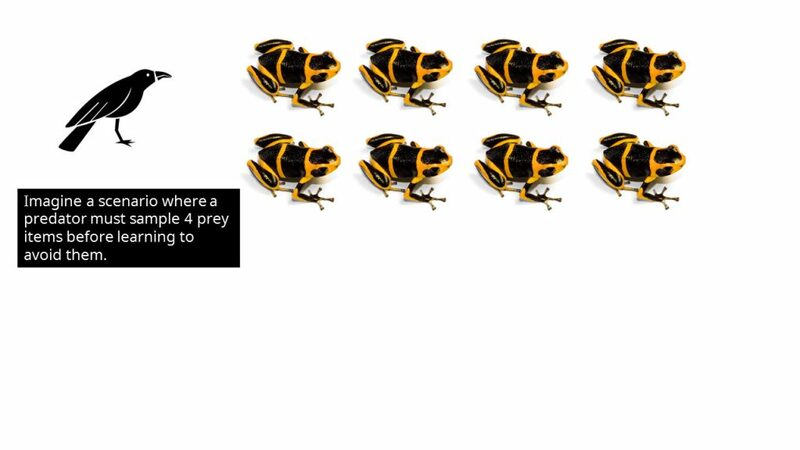 In addition to the rapid color pattern shift, the central populations are much more phenotypically variable than the “parent” populations, consistent with the idea that these populations are mimetic hybrids. In the case of the striped-banded transition zone, there is a shift in color pattern elements, specifically the dorsal coloration, dorsal pattern, and leg color/pattern. However, there is no evidence of assortative mating at the transition zone, and no evidence of a reduction in gene flow between morphs (Twomey et al. 2016). 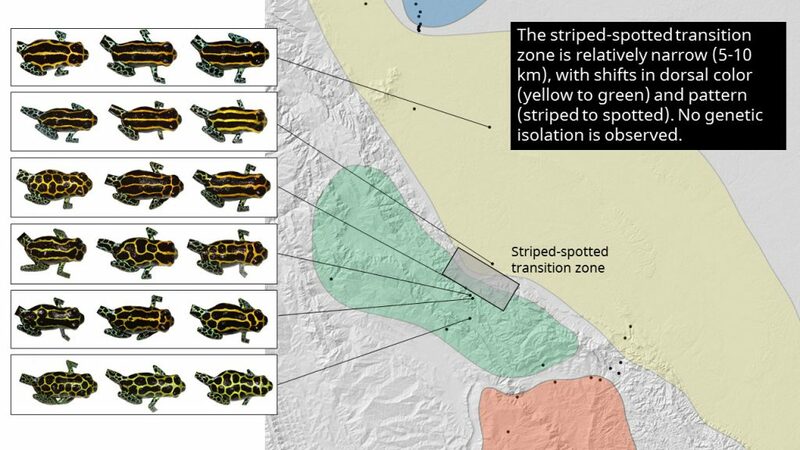 The striped-spotted transition zone is similar in the sense that there is a shift in color pattern elements, but no evidence of reduced gene flow. This transition zone occurs at the lowland/highland transition north of Tarapoto, and tracks the variation seen in the polymorphic R. variabilis. 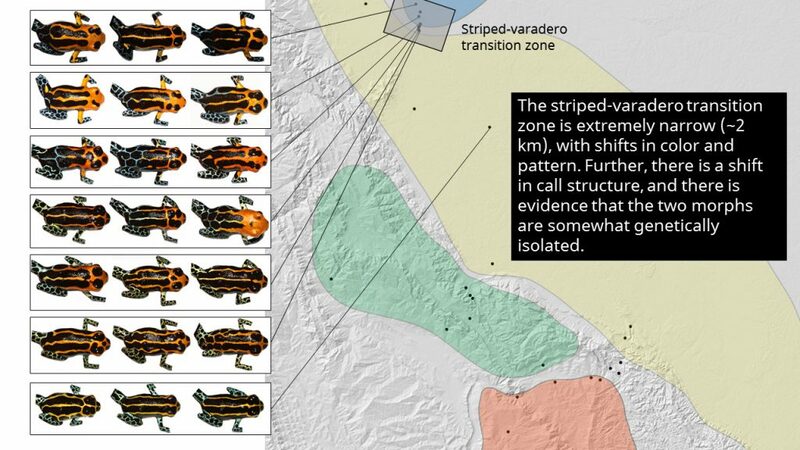 The striped-varadero transition zone is different in a few ways. First, it is much narrower than the other zones, approximately 2 km wide. Second, there is some evidence for assortative mating at the morph boundary, with the local striped morphs showing a preference for their own morph (Twomey et al. 2014). Third, there is relatively strong genetic structuring at the transition zone, indicating that the two morphs may be reproductively isolated. Finally, the two morphs are different in aspects seemingly unrelated to mimicry (but possibly related to reproduction): size (with the varadero morph being much larger), and calls (with the varadero morph having a lower, longer call). 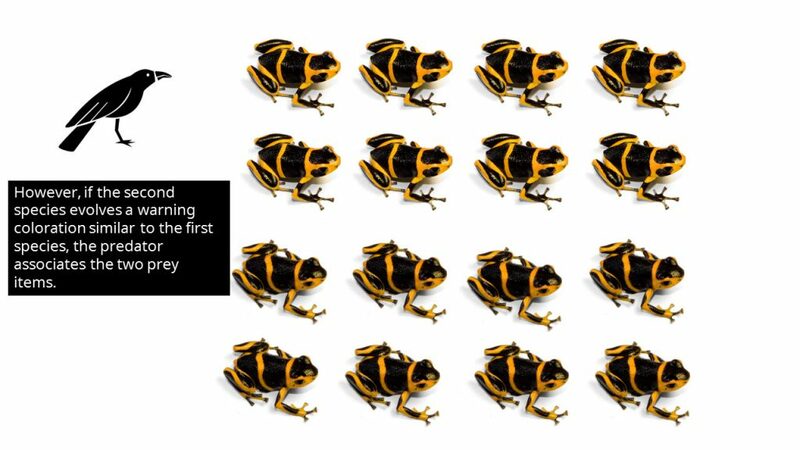 Because of the narrowness of the zone, the presence of assortative mating, and the reduction in gene flow, this zone may be indicative of an early, but incomplete stage of speciation that is being driven by Müllerian mimicry. Schulte, R. 1986. Eine neue Dendrobates—art aus ostperu (Amphibia: Salienta: Dendrobatidae). Sauria 8:11–20. Stuckert, A. M., R. A. Saporito, P. J. Venegas, and K. Summers. 2014a. Alkaloid defenses of co-mimics in a putative Müllerian mimetic radiation. BMC evolutionary biology 14:76. Stuckert, A. M., P. J. Venegas, and K. Summers. 2014b. 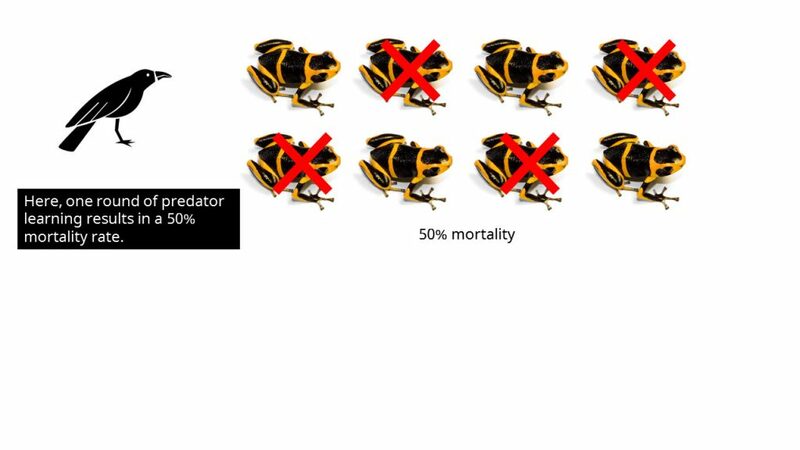 Experimental evidence for predator learning and Müllerian mimicry in Peruvian poison frogs (Ranitomeya, Dendrobatidae). Evolutionary ecology 28:413–426. Symula, R., R. Schulte, and K. Summers. 2001. Molecular phylogenetic evidence for a mimetic radiation in Peruvian poison frogs supports a Müllerian mimicry hypothesis. Proceedings of the Royal Society of London. Series B: Biological Sciences 268:2415–2421. Twomey, E., J. S. Vestergaard, and K. Summers. 2014. Reproductive isolation related to mimetic divergence in the poison frog Ranitomeya imitator. Nature Communications 5:1–8. Twomey, E., J. S. Vestergaard, P. J. Venegas, and K. Summers. 2016. 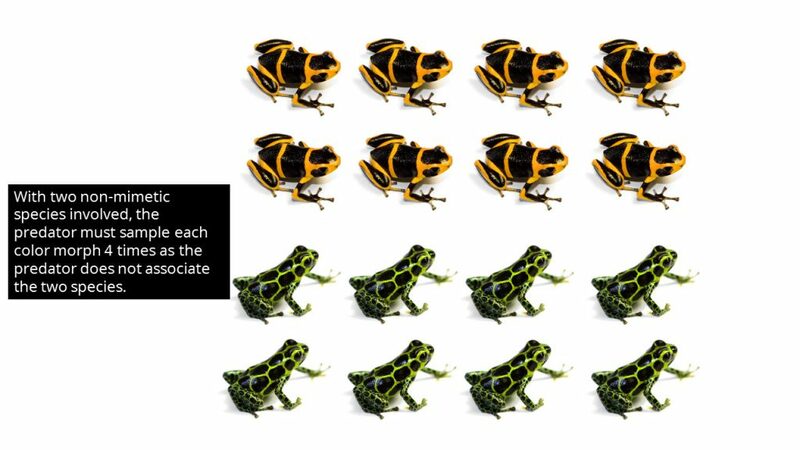 Mimetic divergence and the speciation continuum in the mimic poison frog Ranitomeya imitator. The American Naturalist 187:205–224.